Local Crew Seeks To Turn It Up For Interior Fuzz-Rock Showcase - Gonzo Okanagan Online News, Music, Technology, Sports, Film, Arts & Entertainment, Culture, Wine & Dine... Life! Tune It Down, Turn It Up Showcase is Coming To Habitat August 24th & 25th. Photo taken from Tune It Down, Turn It Up Facebook Page. Isn’t it great watching the entrepreneurs, and inspired individuals in our community succeed, and throw really cool events? Last week I got to have a chat with an old friend of mine about an event that he’s putting on this summer. We’ve alluded to it a little bit here at Gonzo Okanagan – it’s the First Annual Tune It Down, Turn It Up showcase and industry event, on August 24th and 25th. Jason Chrisjansen and I have been long-time buddies, and I had a chat with him last week all about the event and what we can expect from this self proclaimed “Interior showcase for the fuzzed-out, heavy, stoned & strange.” He’s probably one of the most stylish cats in the Kelowna music scene, and has an entrepreneurial spirit to him. This festival is a bit of a step away from Kelowna’s popular festivals like COG, Denim On The Diamond and Keloha – these festivals traditionally recognize more mainstream genres of music like EDM, Country, Folk, Indie Rock and more. Armstrong Metalfest provides a home and haven for the thrash, speed and dark metal bands out there, but what about all the shoegazers, the stoners and the fuzz-heads? Tune It Down, Turn It Up is a step into the harder, fuzzier rock genres, representing the under-represented bands in the interior. 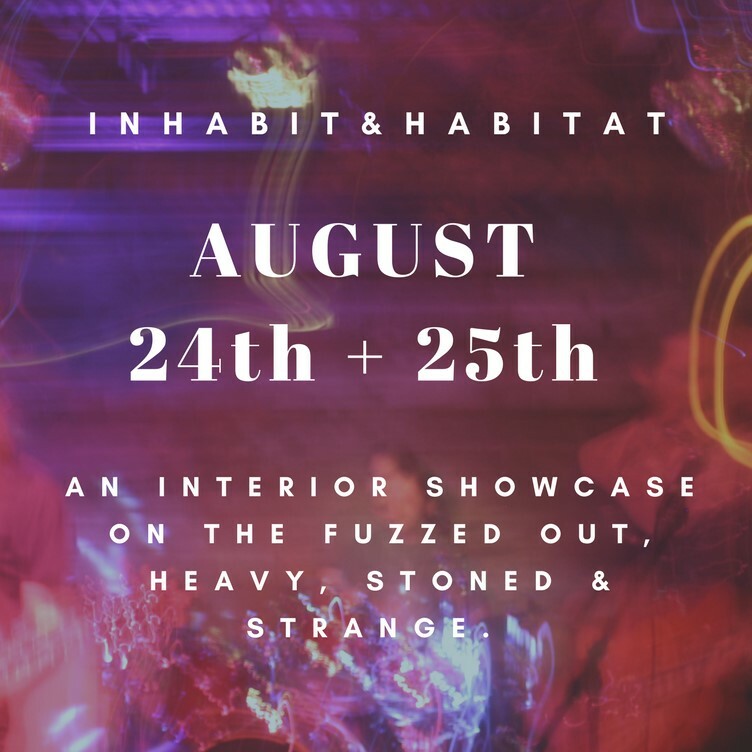 Jason Chrisjansen tells me about these bands, about getting Dave Catching to leave his desert to come up to ours, about the genre, and about what we can expect down at Habitat on the weekend of August 24th and 25th, 2018. Here’s our chat below! Indie Dan: So what is Tune It Down, Turn It Up? Jason Chrisjansen: Tune It Down, Turn It Up is a multi-day music and industry showcase. It’s designed to give a platform to bands and fans in the psych-rock, doom, fuzz and stoner genres because they don’t have much of a platform in the interior. It features 15 bands all from the interior of BC. We have about 15 vendors, some craft liquor tastings, and some visual artists over two days at Habitat. 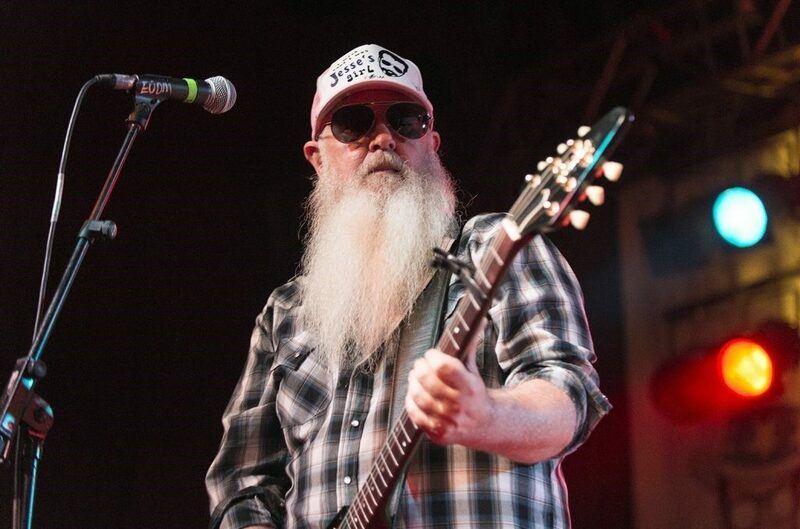 For the industry portion of the weekend we’re flying Dave Catching in to give the music community a chance to listen to and interact with, basically… I mean you can call him a living legend. He’s been in or worked with Eagles of Death Metal, Queens of The Stone Age, Iggy Pop, Kyuss, The Foo Fighters, and Mark Lanegan. He’s a co-founder of Rancho De La Luna, which is a very iconic studio where all The Desert Sessions were recorded. It’s a pretty rare opportunity to hear a guy recount his career about how he made it, you know? There’s a lot of people are trying to do what he did and you could glean some knowledge from someone you wouldn’t normally be able to glean it from. [Dave’s Session] is going to be a Q&A too, so we’re going to open it up to the floor. ID: Very cool – I’ve got a couple questions about Dave Catching a little later, but right now I’m really interested in the festival. Who is on your production team? JC: Myself, Cheyenne Boyko and Eric Gorzinski. We’ve all known each other for many, many years. We’re good friends, and we’re all very into the genre – to the point where we travel to Vancouver and even into the USA to see the shows we like and the bands we like. Cheyenne has been down to Texas several years in a row to go to Austin Psychfest. ID: Nice, so that’s where this idea all came from, the grass roots. So some of these guys & girls that you have seen at these shows, have you booked some of their bands for the event? JC: Yeah, for the most part it’s a lot of people who are just fans of the music, or they’ve been in bands in the past and aren’t anymore. There are definitely a few bands with people that we see, or friends that we know going to these shows. But for the most part you just start seeing the familiar faces and sometimes you don’t even get to know them – it’s just a nodding acknowledgement, like ‘Hey, I know you,’ and you’ve seen then around Vernon, or Kelowna, or Kamloops or something like that. ID: How many bands do you have from the Okanagan region? JC: It’s actually a fairly even split. I’d say there is a slight majority from the Okanagan just being that it’s a larger area, and we’re a bit more familiar with it. Out of 15 bands overall I’d say 9 or so are from the Okanagan. We’ve got two from Kamloops, one or two from Penticton and several from the Kelowna-Vernon area. The remainder are from the Kootenays, and it’s super cool that we have them represented as well. ID: And who are you most excited to see? ID: [Interjecting] –I love Lakeman! JC: Haha, yeah – they’re really interesting. They swap instruments throughout the sets and are just some really talented guys. ID: This sounds really great! You’ve told us a little bit about the Dave Catching forum that he’ll be holding with the Q&A. I heard there may be a select few artists that will be getting some studio time with Dave… Is this really gonna happen? JC: Yes it is. So we’ve partnered with Arc House Studios up in the North end of town here. Adam has graciously donated his time as an engineer, so, basically, we wanted it to be a platform for these bands, we wanted to add as much value as we could. Y’know, bringing Dave in we wanted to get the most out of that. So there will be a select few bands, they’ll have the whole day booked at Arc House, and they’re each gonna get between an hour-and-a-half and two hours in the studio with Dave. The idea is they present a song of their choice to Dave, he gives his professional opinion and critique – you know; song structure, writing skills, production, all that kind of thing. Then the idea is you’re in a studio, you’ve got a couple engineers, a room full of instruments and some microphones… We wanna see some creativity. We wanna see them hop in the booth, maybe flesh out a song with Dave’s input, and then the aim is that these bands will have a really cool learning experience. The result is we would like to have our own mini-desert sessions playlist, a Dave Catching Tune It Down playlist that we can put up on Spotify or something like that. Photo taken from Rancho De La Luna Facebook Page. Jason Chrisjansen, on Dave Catching. ID: Cool… How did this whole connection with Dave Catching come about? JC: [Chuckles] It’s funny, I’ve been a fan of the guy since high school. The first time I ever heard Songs For The Deaf by Queens Of The Stone Age, at the very end he’s the last radio DJ and he says “This is Dave Catching, not saying goodnight – just sayin’.” That sort of piqued my interest about the guy, but recently having booked him I’ve been doing a lot more research. He actually has more of a background in culinary arts. He’s from Tennessee I think and he started a restaurant years ago back home, it was probably burned down. It’s sad to hear, but in hindsight it’s why he’s where he’s at now because he ended up being a guitar tech for Kyuss in the 90s, as they were kind of on their upswing. Then he and his late friend Fred Drake saw some land for sale in Joshua Tree, California and they promptly bought it with the original buildings on it, and that is now Rancho De La Luna. 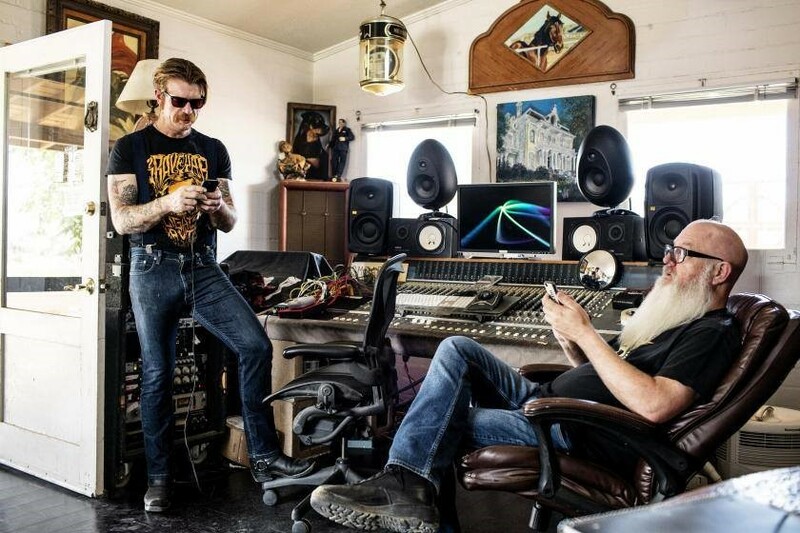 That became the place for Josh Homme and Mark Lanegan and a bunch of other guys – where they would go record, hang out, get inspired being in the middle of the desert. And the albums that came out of that studio – like the first couple Queens Of The Stone Age albums, most of the Kyuss albums – that sort of catapulted Rancho De La Luna, and by proxy Dave, into what I guess you would call a bit of a cult status. He became known as a guy who was at the forefront of this new emerging scene, with these new bands and this exciting frontier, y’know? So he continued to work with people like that. 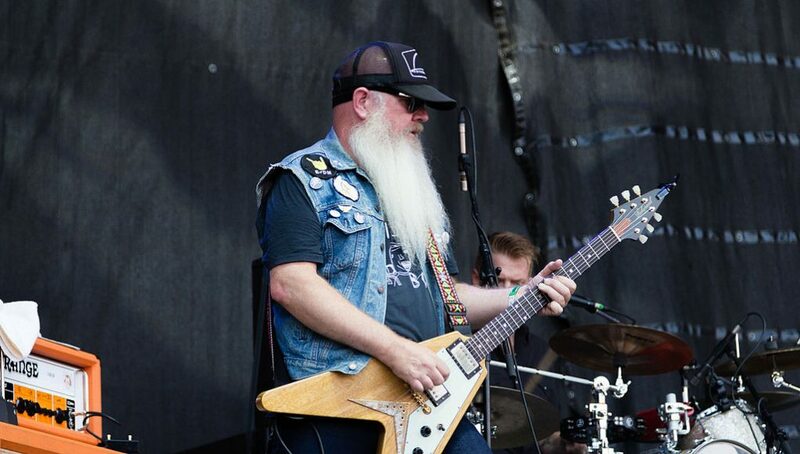 When Eagles of Death Metal started up he started playing with them, grew his beard out and he’s become far more recognizable. […] He sort of created a bit of a centre-of-the-universe around himself with Rancho De La Luna, and what he’s able to do out there and what that environment is able to do with the artists that go out there. There’s an episode of Sonic Highways where Dave Grohl talks about going out there, and how it’s such a different experience. Y’know, you’ll be sittin’ in the live room strummin’, playin’ guitar and the next thing you know Dave says “That’s a good take, let’s go to dinner”, and there’s someone in the next room cooking food and it’s a very different experience. Dave Catching, when asked to attend TIDTIU. ID: So did you just call him up one day? How did this all come about? JC: Well… [Chuckles] … It’s kind of a crazy story. So Cheyenne, Eric and I had the idea for the showcase, and Quinn Best who runs Habitat graciously offered his expertise and experience. He mentioned to us that we should find an industry expert or professional, bring them in and make this more of an industry event as well. No lie, Dave Catching was the first name that popped into my head and I just wrote it off, thinking that that could never happen. So I reached out to a few record labels, and some people who have respect in the industry – and then I thought, y’know, “What do I have to lose?.” I couldn’t find a contact for Dave, so I e-mailed Eagles Of Death Metal’s management, just said “Hey, I’m looking to book Dave Catching.” Didn’t think anything of it, just sent the e-mail and walked away. Two days later I get an e-mail from Dave, and all it said was, “I heard you were looking for me. Here I am.” And I sh*t my pants. [Laughing] I waited a couple days to calm down and then I calmly replied back, and sorta said my piece – gave my pitch. A couple weeks went past and I didn’t hear from him, and… Y’know, whatever – no hard feelings, right? He’s probably got a lot of other more important things to do. … And then he e-mailed me back, and said “I’d love to come, I’m honoured to have been asked.” And then my brain broke, I think I just stared at the computer screen, just re-reading it over, y’know? And that’s sort of how it came about – he’s a very approachable down-to-earth guy, he doesn’t have any representation, I’m dealing directly with him. I think because he was a part of building this scene from the ground up, I think he kind of recognizes and appreciates what we’re trying to do. ID: And the importance of cultivating this smaller scenes, right? JC: [Interjecting] –It’s not just his beard either, he’s got a jet-white mohawk too, so you’ll see him. ID: So, what should we expect on the showcase nights? You had mentioned vendors, alcohol tastings… What are we gonna see there? The vendors are starting at about 3 in the afternoon. We’re working on getting a vinyl DJ to play while the vendors are out. The vendor portion is free entry – it’s basically like a flea market that the Habitat puts on. Then we’ll have music starting at about 6. Friday night is just downstairs on the main stage with five or six bands. It’s more of the psych rock band night – it’s not so heavy, a bit more like the Brian Jonestown Massacre sort of feel to it. We tried to curate the schedule as best we could, but one of the challenges was that you could have five bands, but each band shares up to three or four members. It’s an inherent challenge with the genre. ID: That’s how small the performing scene is, eh? JC: Yeah, the performing scene. You know, when you find people who like – I don’t wanna sound snobby or hipster-ish, but there’s a lot of obscure music out there. You know, when you find people who like the same music as you you sorta’ hold on to them tight and don’t ever let them go. [Laughs] Especially in the smaller towns y’know? There are bands coming from Salmo and Nelson and they share members. It’s probably more of a function of the population out there than really anything else. So then on the Saturday we’ve got the vendors again, they’re gonna start at around 3 once again. We’ve got Okanagan Spirits Distillery setting up an absinthe-tasting bar, so we’re going to have a green fairy serving some green fairy-juice. And that’s also the day those bands will be doing the studio workshops with Dave at Arc House. We’ve been talking to Frequency Winery about getting some bands up there to perform on the rooftop patio and to record in their sound infusion room – so that’s another opportunity for people to check out some of the bands. And then Saturday night we have two stages going, so Habitat has a large room downstairs and a smaller room upstairs. We’ve staggered the sets and we’ll have music going all night upstairs and downstairs. We’re big fans of Levitation. That was started by a band called The Black Angels and more or less it has similar origins. They wanted to put something on for their friends, help out smaller bands, give them a platform, and it started in Austin, Texas. Now it’s imitated world wide. There’s a very successful one in Vancouver every year. We’re hoping to have other events, kind of Tune It Down, Turn It Up Presents – for example, the Dave Catching talk is one. It’s a bit of an umbrella name. The team is working hard over the coming month, and tickets have been moving. This is a first-time festival that supports the whole set of genres – the stoner rock, the fuzz, the doom, psych rock and more – and is looking like a not-to-be-missed festival for fans. For more information, visit the Tune It Down, Turn It Up Facebook Page, and grab your tickets early while they still last! Tickets for the Dave Catching talk are available now as well, and the public is encouraged to attend this talk, even if they aren’t attending the showcase. The Facebook events and access to tickets are below. Daniel Tait is a driven singer/songwriter and composer with a finger on the pulse of modern-day issues and stories. Born and raised on the river in the Ottawa Valley, he spent his formative years paddling, writing, singing, and watching the world move around him. As years passed, he has spent his time travelling and honing his musical and lyrical talents, proving his mettle as a hard-working blue-collar musician. He is a story teller, with an aptitude for satire and political humour.